Suddenly, I have an urge to play a Twilight alchemist who runs a coffee shop. If it doesn't have firedust in it,it's not fit to be called 'espresso'. I thank the Devs for the great game of Exalted! I was ahead of the curb with an idea on this already. The Coffee Shop/Brand is called "A Cup of Calibration". They have only 6 locations. One in each direction, one on the Blessed Isle, and one in heaven. The brand itself is owned and fully run by a Solar Eclipse with plenty of time and political backing. Once each year, during the calibration festivities, this coffee shop is actually given access to celestial wine to make the best damn drinks that can be made with the stuff. In creation, the brand is run by a merchant prince, who otherwise lords over it as though he was the one who came up with the brand. This is of course by the wishes of the Eclipse, not wanted to be the face behind the brand. The Eclipse himself actually works on one of the Baristas that changes which location he works at every 3 years. Always the same (fake) name and person and look, always the same employee, but he moves around a lot. Baristas are trained and have a minimum of craft 3 and a specialty in A Cup of Calibration's menu items before they're allowed to make any drink for actual customers or the public. Instead, new baristas end up making the drinks over and over again for the other employees of each location. Each location has no more than 12 employees on payroll, and has exactly 5 working on any given day. If a site is short-staffed, they will take on and train new employees one by one, only training a new one with the prior new one is ready to serve the public. The location is closed for 11 hours of the 25 hour days, 2 of those hours starting an hour before noon strikes and ending an hour after noon has passed. The other 9 hours are during the night. Each shift lasts 7 hours, the closed hours not included in this time-frame, and within a day, 10 of the 12 employees will have worked 7 hours each. Who works which hours when can be sporadic, and an employee can work for a few hours, pass off their position to a different employee to work a few hours, and come back and work the rest of their hours later. Payment at A Cup of Calibration is quite lucrative, and these employees make Resources 1 as respected mortal craftsmen. 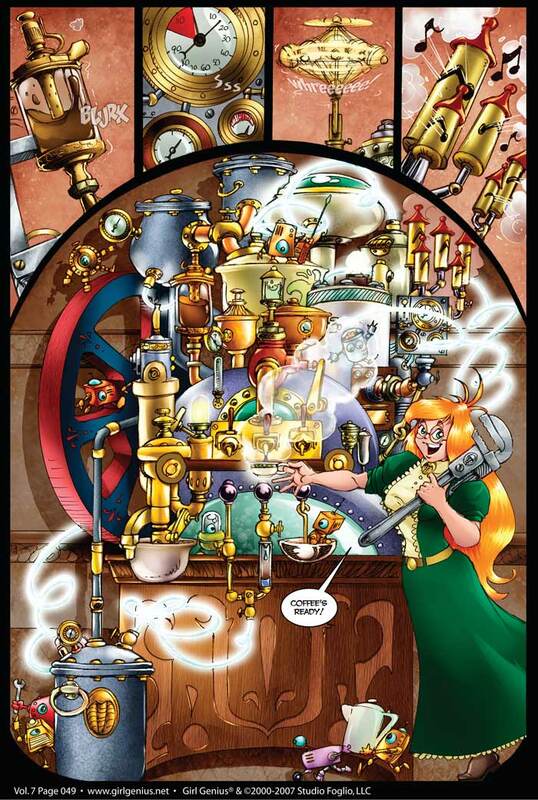 Jokes and Girl Genius aside, I think coffee culture in Creation (at least the parts of it that have coffee) would be pretty fascinating. Whenever I'm in Louisville, I make a point to eat dinner at a great Ethiopian restaurant where they actually do the coffee ceremony. It involves the owner of the restaurant roasting coffee beans in a cast iron pan over open flame, and some equally fancy stuff afterwards. For modern Westerners, who tend to regard coffee as something you get very quickly as a morning pick-me-up, we often overlook how ceremonially and culturally important coffee is in other cultures and older cultures. You're not wrong; coffee was huge in the ancient world. People were killed trying to smuggle it, governments banned it... these humble beans have a huge amount of history to them. Last edited by TheCountAlucard; 07-16-2018, 01:05 PM. I wonder now where coffee would originate in Creation - I guess the closest parallel to Ethiopia, at least climactically, is probably somewhere in the South-East, around the "Great Lakes" region near Harborhead. Judging by where it's currently cultivated on Earth, though, it can probably be grown all across the wetter areas of the South and the warmer areas of the East and West. The southern coast of the Blessed Isle might have a decent coffee crop too. If First Age culture liked coffee, they could have distributed it widely in that time, and I'd expect it to remain grown in the various areas since then. If it's newer than the First Age, though, coffee might well still be relatively confined geographically. See now I'm imagining an 'iced coffee' variant that only grows in the north. I personally would pick the Southeast as well, probably Harborhead because it continues the theme of "proud culture with ancient history dominated in modern times by expansionist empire who loves their products but tries to suppress their culture." It would also allow coffee to be really common in places across the South, which would parallel coffee being a major cultural touchstone in real-world Middle Eastern and North African cultures. Personally, i think brewing (duh!) a nation or two to explore and tinker with the subject could work better overall, in terms of giving more room to toy and tinker with concepts related to ancient coffe culture and trade, without getting bogged down into the themes of already existing places. This feels like a weird statement to make about something spanning an entire world and lasting for five thousand years. The statement can be narrowed to "some parts of First Age culture, at some times" without meaningfully changing the point, that if coffee became popular then, its cultivation would probably spread beyond its initial source area. This is something I was looking forward to including. In our last CoD game, the vampires had an extensive coffee culture - I was riffing on an idea from Tokyo Ghoul, of coffee being the only non-blood foodstuff they could consume and enjoy without difficulty. One of my players surprised us all with an amazing stunt, by joining a real-life Barista's Guild. He flashed his (real life) membership card at the table to gain (his character's) safe access to a Prince's sanctum. Nobody f*cks with a barista under the Prince's protection. The character had also invested a few dots and a specialty in the relevant skills, so while he was brewing and pouring for the assembled undead, he had their attention to address the story issue at hand. I echo a lot of themes from game to game, so that would be something I'd want to add back in, if I can ever get Ex3 off the ground.